Rexy has been the star of the Jurassic Park franchise for over 25 years. She first wowed audiences in 1993 and now she's still a part of the new Jurassic World franchise in the 2010s. There have been lots of plot points over the course of all the movies, but for us, it really boils down to one thing. It's really all about the mighty T-Rex! Yes, it really has been same T-Rex starring in all those films. So we're thinking, it's about time she got an understudy. Do you have a candidate? No, we're not talking about having some T-Rex eggs tucked away in the basement, ready to hatch. We think we should get someone suited up to be the next dinosaur star of the franchise! We would, of course, suggest choosing your own kid. When you get them suited up in our Jurassic World 2 T-Rex Costume for toddlers! It's officially licensed from the latest Jurassic movie, Jurassic World 2, and it has the dino details that we all know so well. In fact, the only thing it needs is a kid with a great dino roar! This costume is styled as a jumpsuit, and it's fully printed with dino detail, even including a Jurassic World logo on the side. A tail is attached in the back and it's stuffed with fiberfill. Boot covers are attached, and they fit right over your child's shoes to make them look like T-Rex feet. All you need to do to complete the effect is to secure the T-Rex headpiece. It fits with hook & loop fastener beneath the chin, and it has soft-sculpted dinosaur face that sits on top of the head! 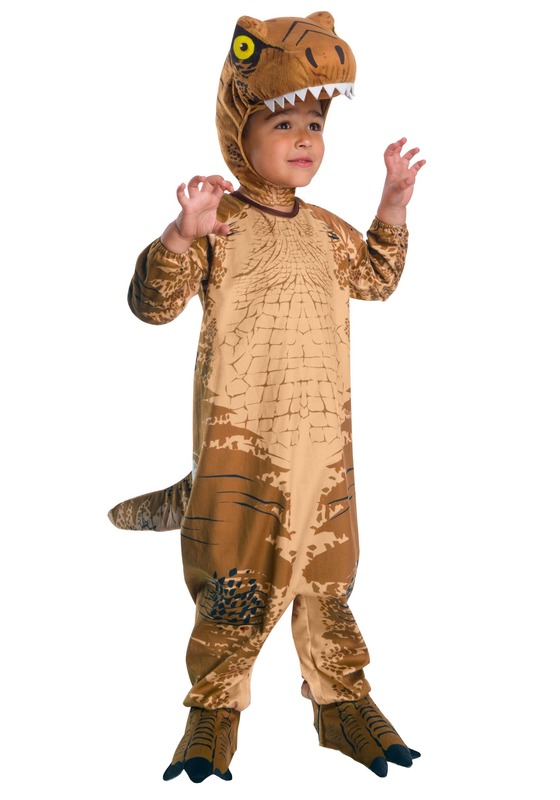 Choose this T-Rex costume for toddlers, and we're sure your little one will be ready to roar. Be sure to check out all of our Jurassic World costumes to find other styles for kids of all ages!